Here is a link to the Guardian newspaper which is a superb matched pair of Himalayan vistas taken 50 years apart (http://www.guardian.co.uk/environment/2009/jun/04/byers-himalaya-changing-landscapes#). The originals were taken by Fritz Muller and Erwin Schneider in the 1950s to map, measure and photograph the glaciers of the Himalayas. The American mountain geographer Alton Byers has returned to the precise locations of the original pictures and replicated 40 of the panoramas from the original 1950's expedition. This article shows a paired vista of the Imja glacier - as the paper says; "the juxtaposed images are not only visually stunning but also of significant scientific value". 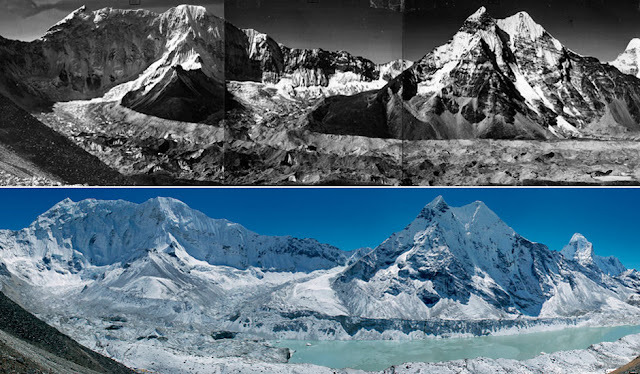 In particular this pair of images shows the transformation of the Imja glacier in the 1950's to the present day Imja lake. "I think". Charles Darwin July 1837.